Doris Nicolls (Receptionist for Chamber of Commerce). Caption slip reads: "Monday. Photographer: Richardson. Date: 1953-12-02. Reporter: Swaim. Assignment: Tourn. of Roses business, Pasadena. 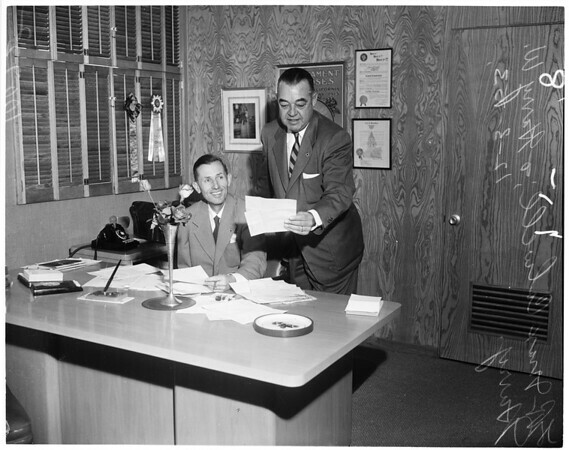 K7-8: Max Colwell, seated, manager of Tournament of Roses Assn., and Harry W. Hurry, president, discussing expenses and other business of giant Rose Parade. K21-22: Elsie Whiteside, left, secretary of Pasadena Junior Chamber of Commerce, and Doris Nicolls, receptionist for both Chamber of Commerce and Tournament of Roses Assn., crossing street in front of new C. of C.--Tourn. of Roses Bldg., which also houses Junior Chamber, Pasadena Realty Board, and Pasadena Civic Music Assn."